On May 6, 2014, Governor Jack Markell signed House Bill No. 199, making the shell of the channeled whelk (Busycotypus canaliculatus) the official state shell of the State of Delaware. 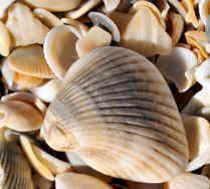 The bill states that the channeled whelk shell, also known as a conch, "contributes to the beauty of our seashores, as well as to the marine economy of the State of Delaware." 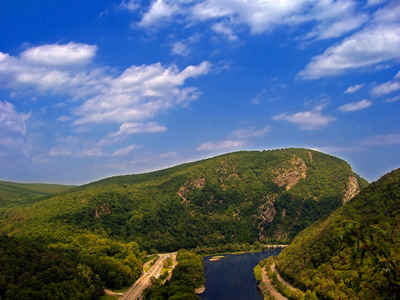 Louis L. Redding Middle School sixth-grader, Allyson Willis, a Delaware resident and a member of the Girl Scouts of the USA began petitioning the state more than a year before the adoption, working with state Rep. Quinn Johnson, D-Middletown, on the bill. It was Willis who lobbied state lawmakers to secure the bill's passage. The channeled whelk, Busycotypus canaliculatus (formerly known as Busycon canaliculatum) is a large snail that reaches 5 - 8 inches in length. The shell is generally pear-shaped, with a large body whorl and a straight siphonal canal. There is a wide, deep channel at the sutures between whorls. There are often weak knobs at the shoulders of the whorls. Finely sculpted lines begin at the siphonal canal and revolve around the shell surface. Body color is typically a buff gray to light tan, with darker brown to brown-red vertical banding. The shell aperture is located on the right side, with left-handed specimens being rare. 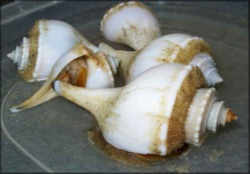 Channeled whelks prefer sandy, shallow intertidal or subtidal areas and can be common in these habitats. 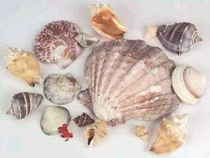 Channeled whelks range from Massachusetts through eastern Florida, and have been introduced into San Francisco Bay, California. Passed unanimously by the Delaware Senate. 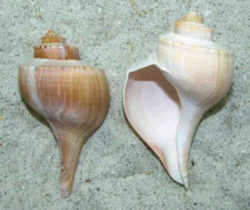 The shell of the channeled whelk (Busycotypus canaliculatus) shall be the official shell of the State.